On Wednesday very early in the morning my Inca trail started. The Inca trail is a 50km hike through the mountains towards the well known Inca site of Machu Picchu. It is not the only Inca trail, there are thousands of kilometers of paths created by the Inca all throughout South-America, but this is the most preserved one. In retrospect I might not have booked this trail but taken a much cheaper jungle trail towards Machu Picchu with adventure stuff along the way, but since I had to book this legendary trail months in advance and was told it was definitely worth it, I did not contemplate any other option and just went for it. Our group was different from the kind of travelers I had met up until then. Most of the people that I met that were travelling for months could not deal with such a preparedness of having a fixed date, months in advance and such a costly price, so most of the people in our group were only in Peru for the Inca trail and flew back, or flew to the next country on a fixed timeline. There was no porter included in my booking, and I wasn’t even considering paying money for someone to carry my bag. 17 year old scouts-me would have been ashamed of the idea. I used to go trekking around with a backpack that contained everything I needed for 2 weeks in Greece and in the south of France. Hell to the NO would I have someone carry my 4-day pack. But after falling off the sandboard on my back a few days before, I was suddenly in total panic about the fact that I had to carry a sleeping bag and mattress for 4 days. I was not even capable of walking the stairs in the hostel without the feeling of a knife being stabbed in my back and I almost considered cancelling my trail, which would not grant me a refund. But I just sucked it up and went for it anyway. I packed the strongest ibuprofen painkillers that I could find and religiously took one every 4 hours. I smuggled my sleeping bag in the pile of stuff that the porters had to carry for the other people in the group, and gave a bigger tip at the end of the trail, but the shame is still there. Even with the excuse of my backpains, I still felt immensely guilty/ ashamed about the amount of luxury we had on this camping trip; we got 11 porters for 10 hikers and 2 guides, who carried all the tents and kitchen supplies and personal goods O.o. And the food. Oh god, the food! Every meal we got 4, 5 separate dishes of insane yummieness, popcorn and biscuits at tea time and fancy desserts à la bananas flambé, and jello cake. While we would start leaving, the porters would pack up the entire camp and bypass us while we were walking at snailspeed (while they were sprinting up and down insanely steep paths) to the next resting stop to set up the camp and kitchen again. A very weird experience for me, since I’ve never been on such an organized camping trip. Every day 250 hikers are allowed on the inca trail, and the same amount of porters, who would all stop on the same resting point, creating a sort of highly organized chaos, with several little camps and sanitary blocks. While I wasn’t used to this type of camping and was judging it so much,I also realized it is really nice for people who have never gone camping before. They would not know at all what to do when setting up camp and what to bring on such a hike and would be intimidated out of doing it. Because the trail is so absolutely spectacular, everyone should have the opportunity to walk it, whatever help it requires. So I tried to stop bitching about the luxury. The first day wasn’t that insane, and our guide Angelo also kept repeating that it’s a practice day to get a bit in the rhythm of hiking. Mostly because the next day was very notorious for being extremely heavy. It was one day of nothing but uphill, climbing about 1000m (going up a full kilometer vertically!) until reaching dead woman’s pass on 4,200m above sea level. Our group was quite diverse in tempo’s and levels of fitness so we quickly drifted apart. I mostly walked the entire day with Helen, who was on the same level of not being completely rubbish, but also not the type to be wearing half-marathon-shirts ;). Being on heavy painkillers and feeling lightheaded from the altitude made me feel a bit high, and I sang ridiculous songs most of the trail, for which I still don’t know how much Helen and the rest of the group hated me. All in all the dead woman’s pass didn’t create a dead woman out of me (btw; sexist much?) and I was only struggling in those last 300m where you can see the ending but you have to pause every 2 minutes to breathe (and so imagine me singing in such state). But the view was absolutely amazing, standing on such a high point, seeing both sides of the mountain and valley. The base camp of the day laid down another 2 hours of going back downhill on the other side of the mountain. Right when we arrived and took a nap in the tents it started pouring rain, after having had 2 days of only beautiful weather. We would stay lucky like that, and we were such fortunate people to not have to take out our rain poncho’s and backpack covers even once. The third day was the most beautiful one in my opinion. We hiked a part up and then it was almost only downhill. We passed a lot of Inca remains (remains, not ruins! because these were not ruined by the Spanish, just abandoned by the Inca so they were never destroyed) and beautiful mountain sceneries. When I was first told it was the most preserved Inca trail, I didn’t really understand the big deal and importance, but the longer I walked it, the more I became astounded by the ingenuity and craftsmanship of the incas, who literally built a pedestrian highway through mountains. The entire path was made out of perfectly fitting carved stones and heavy boulders. The steps were quite well designed for walking this rigged and rough mountainous scenery, and our guide told us that back in the days messengers would be able to pass a message along the trail in less than 4 hours. 4 HOURS! And it took us 4 DAYS!! Thanks to national geographic they even tested the theory that a message could be passed along the entire Inca trail running from Ecuador all the way to Argentina in 24 hours. switching messengers in the watchtowers along the way made it perfectly possible and the theory was proven correct! The more I learned of this amazing part of Quechuan history (the word for native Peruvians), the more I became saddened by the reality that such an amazing civilization was completely destroyed by the Spanish Colonization. Just because the Inca civilization seemed different, didn’t mean they were stupid, or behind in evolution. They hadn’t invented the wheel because they couldn’t use it in such landscapes anyway. They didn’t have writing the way we know it but they had other means of communication. Messages were passed with a bunch of string in raffles, and the message would be encrypted in the pattern of knots in the strings. They had the most amazing agricultural tactics, building a cornfield on a 45% inclination and were very well advanced in knowledge of the universe and stars. But the Spanish had seen the Incan’s gold, which had no significance for them except for it symbolizing the sun, their god. And they had to go and abuse the Inca’s trust and friendliness and destroyed and enslaved them. An interesting perspective our guide added to this, is that because of this insane brutality of the Spanish, the Quechua never wanted to assimilate with them and a lot of Quechuan history and customs is still preserved and accessible. Compared to Brazil where the Portuguese were less ruthless and came with gifts, a lot of native Brazilian culture disappeared, or is only to be found deep in the amazon. The true Brazilian doesn’t really exist because it is born from many cultures. The true Peruvian is the descendent of the Inca, and is damn proud of it as well. Our guide was very passionate talking about the Incan history, and had been required to take at least a 5 year historical education in order to guide groups, showing that Peru cares about how their history is being taught to foreigners. 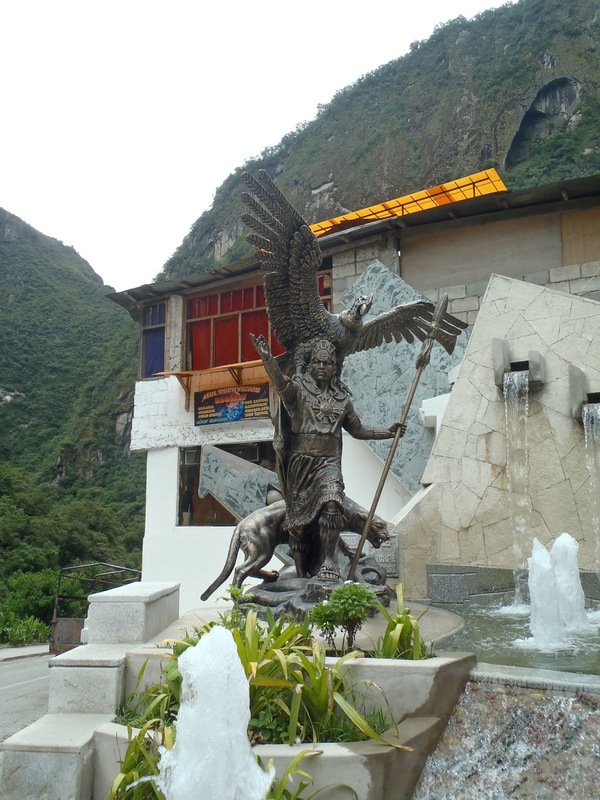 While Macchu Picchu is of course a super big touristic attraction and the government makes a ton of money out of it, it really does not feel like they’re trying to exploit the site just for monetary value, and they are really just proud of showing their ancestors. We arrived at the sun gate after another hour walk, with almost all the 250 hikers walking like cattle in speedtempo behind each other. The view from the sun gate was spectacular, being the highest point from where to view Machu Picchu. Another hour walk brought us to the site itself, with the recognizable mountain rising among the clouds over the ruins. After some picture time our guide gave us a 2 hour tour of the so called “lost city of the Incas”. While it always is said that it was discovered by Hiram Bingham, in reality most locals knew about the city, and it was even inhabited by some Quechua when it was first discovered by Bingham in 1911. They just didn’t feel like the world should know about it like Bingham felt. He was also not the great archeological hero it seemed, since he was mostly just looking for gold, writing in his diary that he was disappointed after he found the city (since he didn’t find gold). The most likely purpose of the city was its proximity to the jungle and gain easy access to the coca plant. While I was surprised about the importance attached to this plant, the coca plant was apparently super important for the inca. Comparable to what the olive tree is for mediteranean countries, or tea for asian countries. While we now know it mostly as the source of extracting cocaine, the plant has far more qualities than the cocaine inside (just like coffee has caffeine and tea has theine). It has an energetic, medicinal and nutricious value that was useful for a variety of purposes back in the days, like anesthetics during operations and a cure for nausea, headeaches etc. which makes it logical that they needed better access to this magical plant. While it became disgraced because of its association with cocaine, Peruvians still see the coca plant as an important part of their history and culture, and I was also very thankful for it during the Inca Trail to help with the altitude. Machu Picchu was the highlight of the whole Inca trail, but it was definitely worth dong the entire trail. Machu Picchu was only the first of the 3 cities on the trail to the jungle, and the trail gives a good idea how it was not an ending point but a part of a vibrant society. The other cities were discovered later, and no train was built to reach them, so a lot less people know of them and visit them. To have the world visit Machu Picchu, Peru built a train towards the site, with a little town on the foot of the mountain, Aguas Calientes, a sort of homage to Machu Picchu. All in all it was a once in a lifetime experience that I could recommend everyone to gain!